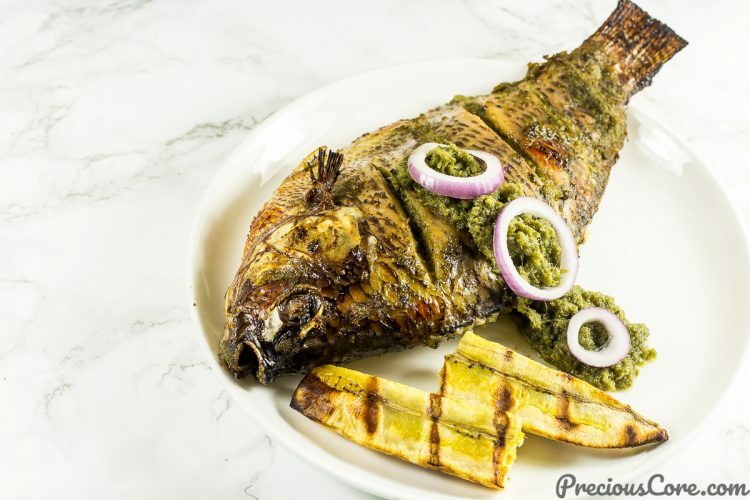 The great African oven grilled tilapia! 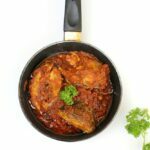 Moist, spicy, with awesome flavors, this oven grilled fish is so tasty! 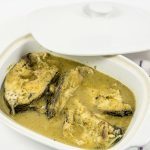 Read on to learn my technique for ensuring that seasoning gets right to the bone of the fish; Plus my insanely good technique for ensuring that the fish remains moist after cooking. 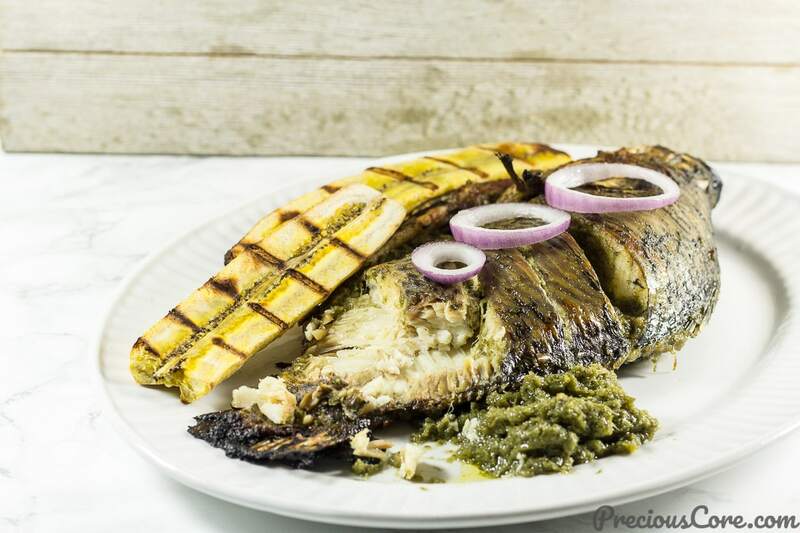 Grilled fish is a West African delicacy. On the roadside in my country, Cameroon you can often spot women, mostly at night laying mackerel fish on rustic grills. As they deep their basting brushes into spice-filled bowls and brush spices over the fish, the smoke from the coal beneath the fish makes its way past the fish into the air. It is a pure delight to inhale the smoky spicy aroma of the fish. It is even better when you get a chance to munch on one. Pure epicness! 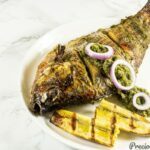 This oven grilled tilapia reminds me of the roadside grilled fish experience in my country. The best part is all of this can be made in your oven! And I make a really tasty green sauce to go with it. You can purchase whole tilapia from Asian or African stores. Africans love whole fish! It is so easy to grill fish in your oven and it turns out dry, so chewy and so undesirable. Been there, done that. So to ensure that the fish doesn’t dry out, I first cover the fish with foil and let it cook then I take off the foil and broil the fish to give it some color. You can watch the video to see how I do this. Use fresh herbs and spices for best flavor but if you are short on time, use dry spices and herbs mixed with oil. If you are using a gas oven, rotate your tray while broiling because gas ovens heat unevenly and will cause some portions of the fish to burn while other parts don’t gain any color. For a great tasting fish, marinate the fish and keep covered in the fridge to absorb all the flavors overnight. You can then take it out and proceed with grilling the next day. Read this post to learn more about grilling fish: 3 awesome ways to grill fish. Hope you enjoy this oven grilled tilapia recipe! 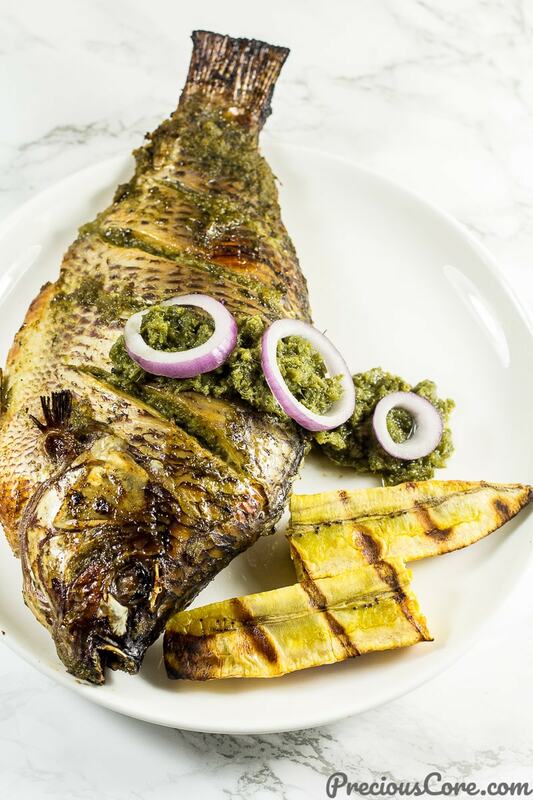 Whole tilapia fish seasoned the African way and grilled in the oven. 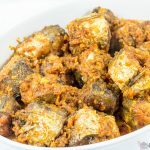 Learn my special marinating and grilling technique which ensures that the fish remains nice and moist. 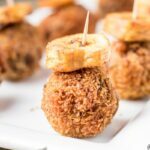 Serve this with some grilled plantains for the full experience. Hope you enjoy! Combine the celery, parsley and basil together with the garlic, ginger and 1 onion (roughly chopped) in a blender. Add a quarter cup of water and blend into a paste. We'll call this the green spice mixture. Set the green spice mixture aside. Use kitchen shears to trim the fins of the fish. Totally cut out the fins towards the tail of the fish. Also use a pairing knife to cut out the gills from the head of the fish. Rinse fish thoroughly and pat dry with paper towel. Make four diagonal cuts on each side of the fish. Sprinkle on 1/4 teaspoon of salt and 1/4 teaspoon of withe pepper. Rub well all over the fish. Mix together 4 tablespoons of the green spice mixture with 2 tablespoons of oil and 1 teaspoon of bouillon powder. Rub the mixture all over the fish being careful to fit some into the diagonal cuts. Brush a baking tray generously with oil then place the fish on top. Cover with aluminium foil and let it marinate for at least 30 minutes or overnight. Place fish while covered with foil to cook in preheated oven at 400 degrees Fahrenheit (200 degrees Celsius) for 20 minutes. Remove fish and take out the foil covering. Brush with a little oil then set oven to broil and place fish back in. This helps give the fish some color on the outside. Remove fish and let it rest then you can serve with some green sauce and your favorite side. Mine is ripe plantains! In a sauce pan, combine the remaining green spice mixture with the remaining oil and bouillon powder. Add in 1/4 teaspoon of white pepper and 1/4 teaspoon of salt. Stir to combine and cook on medium heat for about 5 minutes. Be careful not to overcook the green sauce so it doesn't turn brown. About 5 minutes is a cook time for everything to simmer together. This grilled tilapia is on the hot side, which means the heat from the pepper is very present. If you can't tolerate heat, omit the habanero. Hi Precious. I don’t see where I should add the habanero pepper. 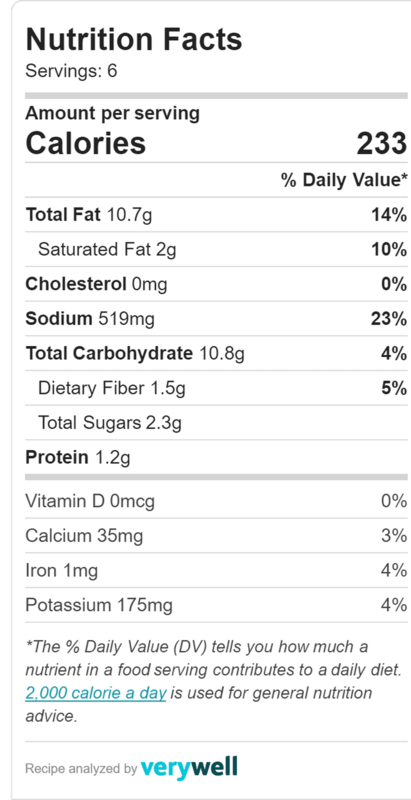 I’m guessing it’s in the blender with the green spice mix? Thank you!